There have been a number of recent developments in the arenas where money and migration mix. Good News. One of the most egregious yet obscure of the Obama era moves was the decision, taken deep down within IRS, to, in effect, pay illegal aliens to stay in this country, with larger payments being made to families with more illegals than those with fewer of them. These payments encourage illegals to stay in the country and multiply, or at least to pretend to multiply. We are talking about additional child tax credits (ACTCs) of as much as $1,000 for each child, something implemented in the 1040 process. There are strong indications that some illegals file for more children than exist, for children still outside the United States, for genuine but illegal alien kids, or for some of each. Since the key part of the decision in favor of these payments was an agency one, the Trump administration could have saved billions had its people in Treasury reversed the policy this past winter. They did not do so, but it looks like Congress may fix the problem. According to Polizette, the tax cut bill, as passed by the House, contains a provision that would mandate that dependents claimed under the ACTC must have Social Security numbers, which are issued only to those with claims to legal status in the United States. Under the current system, people with Individual Tax Identification Numbers (ITINs), which can be obtained by illegals, can get these benefits. Rep. Luke Messed (R-Ind.) succeeded in getting this into the House bill. Whether a similar provision is in the Senate bill is not clear at the moment. My preference would have been to put the provision in some other legislation, rather than the highly controversial tax-cut bill, but that the language has been adopted by the House is obviously a good sign. EB-5 Extension. 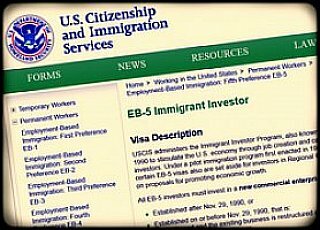 The main part of the EB-5 program — the granting of a family-sized batch of green cards to aliens making $500,000 in Homeland Security-approved, but not guaranteed, investments — is scheduled yet again to sunset on December 8. Everything I hear on the Hill indicates that there will be another brief extension of the program, presumably carried in a continuing resolution to fund the government. Meanwhile, America's judges (and the rest of us) continue to be burdened with litigation on specific cases, such as the two described below. To make an obvious point: There would be none of these cases if EB-5 did not exist or if it were tightly administered, which it is not. The governor, who was president of the firm, left it five years ago to run for state-wide office and the problem has been in and out of the courts and the press ever since. Rodham was in charge of the related EB-5 regional center. EB-5 Criminal Case. A much larger EB-5 case ($50 million) has been closed in California, with a guilty plea from the principal, lawyer Victoria Chan. According to a U.S. Department of Justice press release, she pleaded guilty to federal fraud and money laundering charges, all related to the massive misuse of EB-5 funds. This is just one of the many EB-5 fraud cases we have been writing about in recent years, including other large, or larger cases in the Washington State, Chicago, South Dakota, and Vermont. There were also many other EB-5 fraud cases in California.